Fertile, well-drained soil with a slightly acidic pH. Choose full sun for Oriental persimmons. American persimmon trees tolerate partial shade from high pines or other typical neighbors. Oriental persimmons tolerate cold to 10°F (-12°C). American persimmons tolerate much colder conditions, often surviving to -25F (-32C). Persimmons usually need no fertilizer when grown in lawns. Too much nitrogen can cause fruit to drop. Mint. To get good fruit set, male and female trees are required of American persimmons. 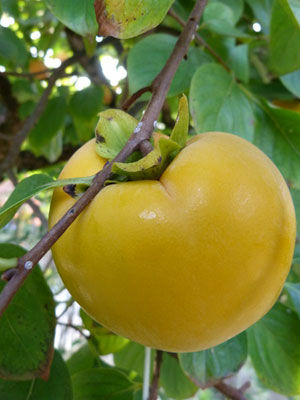 Oriental persimmons are self fertile, but fruit better when multiple trees are grown.